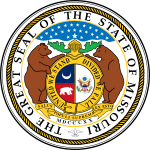 The Missouri gubernatorial election of 1972 was Missouri's 43rd gubernatorial election. The election was held on November 7, 1972, and resulted in a victory for the Republican nominee, incumbent State Auditor of Missouri Kit Bond, over the Democratic candidate, Edward L. Dowd, and Nonpartisan Paul J. Leonard. ^ "MO Governor Race - Nov 07, 1972". Our Campaigns. Retrieved 2013-02-09.